Perfect pork tenderloin steaks are melt in your mouth juicy using this 2 step, baking and frying method. 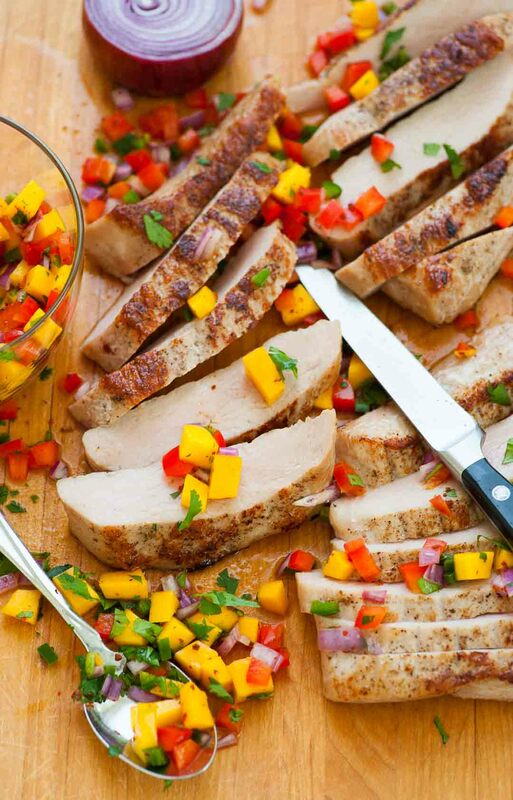 Add a spicy mango salsa for a wonderful combination of flavors. Tough and chewy is not how you want your pork, but often enough it seems that’s what happens. It just gets overcooked. In the recent Cook’s Illustrated magazine, they presented a cooking method to avoid over done, tough pork. 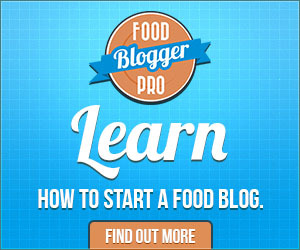 What you do is cut pork tenderloin into portions, then pound the portions into 1″ steaks. This allows the meat to heat more evenly. The pork then is slow baked in a 275° oven until the internal temperature is 135 to 140 degrees. For me this took 30 minutes. You then remove the pork and let it rest on paper towelling. This rest period stops the cooking at a favorable internal temperature which in turn, allows the meat to retain it’s juiciness. 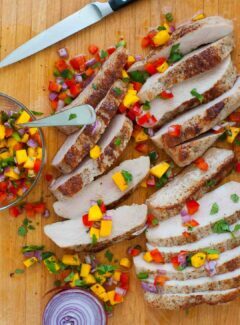 Juicy pork is tender pork tenderloin steaks. To finish off the pork, you give it a nice quick seer in a very hot skillet to brown the exterior but not affect the internal temperature too much. The salsa I made to go with this is similar to the salsa in Bacon Wrapped Scallops with Mango Salsa. I wanted to spice it up a bit and added a minced jalapeno pepper. This combination is very tasty. If you wanted to, you could substitute diced pineapple for the mango. Pineapple is a natural with pork. Next time you cook up a pork tenderloin, use this baking/frying method for super juicy, tender pork tenderloin steaks. 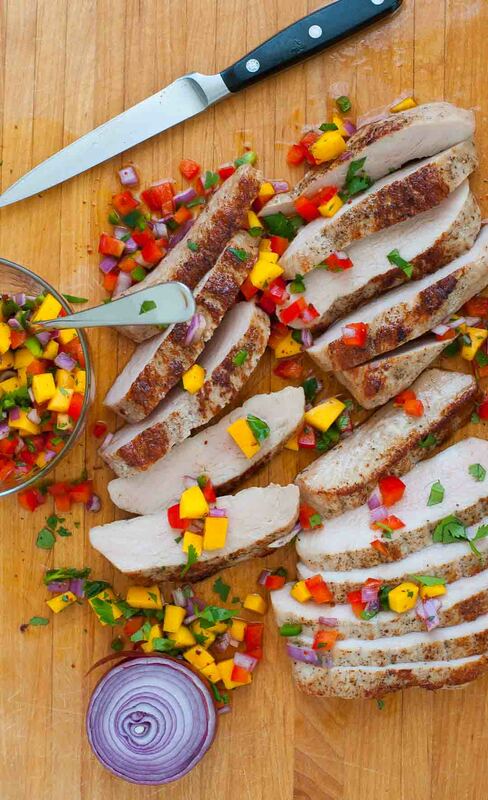 Delicious, juicy pork tenderloin melts in your mouth. Add the spicy salsa for a perfect combination of flavors. Trim tenderloin of fat, slice vertically into 3 portions, and pound to 1" thickness. Place a rack in a rimmed baking sheet and spray with cooking oil. Salt and pepper all sides of the pork and place on the rack and put into oven. Bake for 25 to 35 minutes until the pork temperature is 135 to 140 degrees. (Mine took 30 minutes). Remove from the oven and place the pork on doubled up paper towels. Also place a doubled up paper towel over the pork. Let the pork rest for 10 minutes, then pat dry before frying. Add vegetable oil to a high temperature skillet, (not non-stick), and put on medium high heat until the oil just starts to smoke. Add the pork steaks and fry both sides until browned, 1 to 2 minutes per side. While the pork bakes, prepare the salsa. Chop the ingredients and combine in a medium sized bowl. Taste and season with salt, (1/4 to 1/2 tsp). 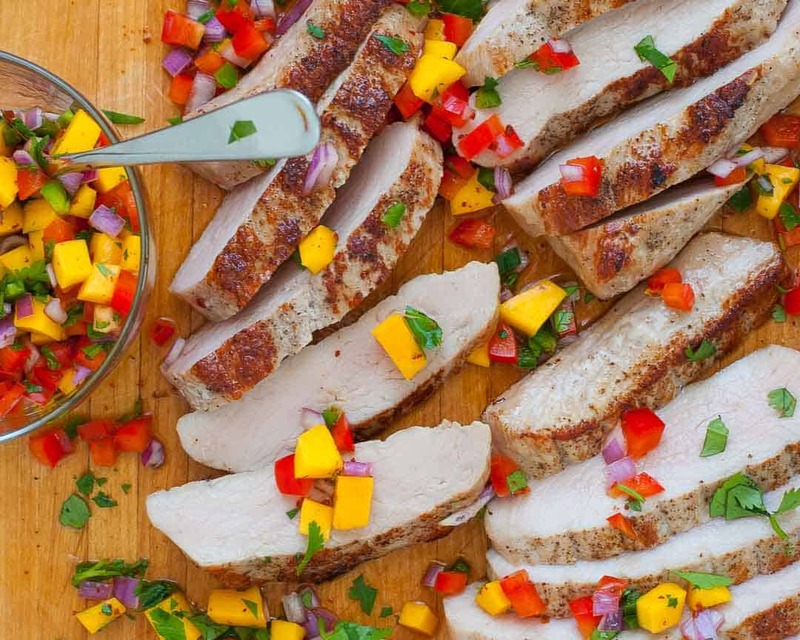 Serve the pork hot from the skillet with the salsa garnish. Pork baking/frying technique from Cook's Illustrated.